DietMaster 2100 v11 is like having your own private nutrition counselor! Quickly analyze & design your eating program or use ready-to-print optional recommended eating plans & grocery lists designed by Registered Dietitians or Doctors. We offer it in two editions. 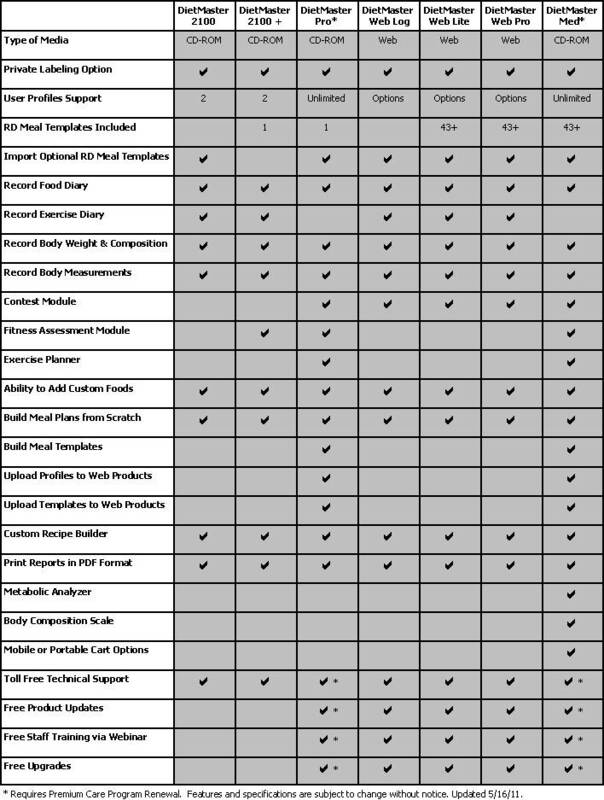 Take a closer look at the options below. The Standard Edition installs directly on your personal desktop or laptop computer and is available for both Windows PCs and Mac systems. DietMaster 2100 package will enable you to keep a food diary, plan your meals, add favorite foods, log and track exercise and keep track of your weight control goals. This edition also includes a sample low carbohydrate eating plan and the ability to import other optional RD meal plan templates. Since this is personal software, you are limited to entering your personal profile and one other profile for a friend or family member. It is recommended that a 586 or Pentium class processor be used with a minimum of 32mb RAM, hard disk drive with at least 30mb of free disk space, mouse or other pointing device and SVGA color monitor with a .28mm dot pitch. Note: We cannot quarantee the functionality of our software products on older Windows platforms that have been discontinued by Microsoft. All hardware returns will be subject to a 35% restocking fee and must be returned within 30 days from the delivery date. All items must be returned in the original manufacturer's box or packaging or refunds will be refused. Please call to receive a Return Materials Authorization (RMA) number prior to returning your product. Important! 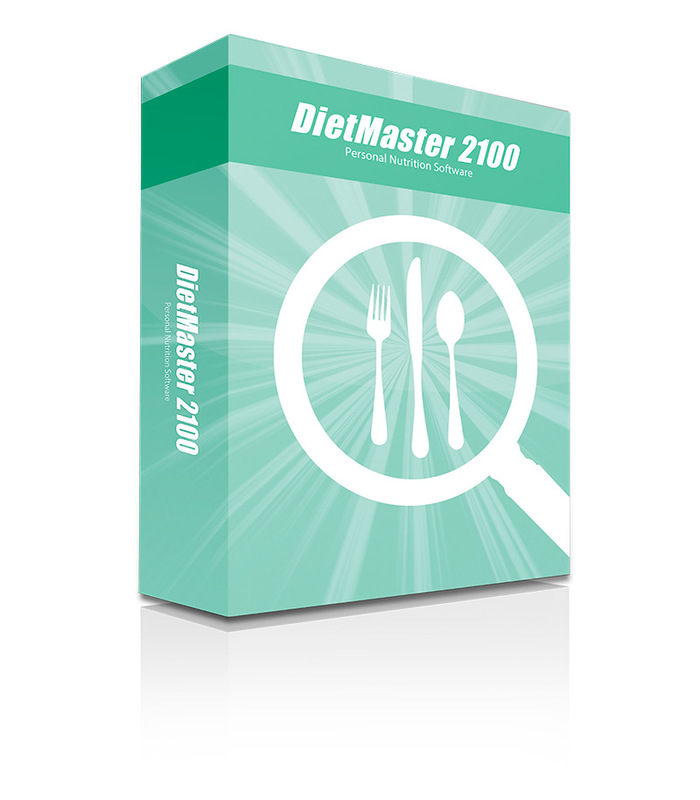 DietMaster 2100 nutrition software editions are not designed for professional use. Certain personal profile information cannot be changed once entered (e.g., birth date and gender). DietMaster 2100 and other DietMaster products are not intended to replace the expert advice of a medical practitioner and are not designed to treat diseases of any kind. is you can customize and add anything you want to your customers meal plans! Saves Time...Easy to Manage a lot of Clients...Clients GET RESULTS PERIOD! The Staff at DIETMASTER always has fast customer service and they care about their customers. GREAT COMPANY"